In Hear This, A.V. Club writers sing the praises of songs they know well. This week, we’re picking our songs that highlight some of our favorite guitar riffs. As is often suspected of critics, I’m a former musician of meager accomplishment, having spent a good 15 years or so playing in bands. In the most (relatively) successful of these I played guitar, where I learned the importance of always having a good riff for that inevitable moment you’re standing there sound-checking, often in front of an audience, and already faced with having to prove yourself. Over that decade-plus, I had a few in my stockpile, in varying degrees of kitsch and crowd-pleasing: Beastie Boys’ “Gratitude,” Simon And Garfunkel’s “Hazy Shade Of Winter,” AC/DC’s “Rock And Roll Ain’t Noise Pollution,” etc. But even today, on the rare occasions when I pick up my guitar for a select audience of my cat, my fingers most often go right to David Bowie’s “Rebel Rebel.” It’s a riff that lodges itself in the player’s hands as firmly as it does the listener’s mind. And even in my clumsy renditions, it always feels incredible. Bowie’s farewell to glam rock, “Rebel Rebel” was written primarily by Bowie himself, with some fine-tuning from Alan Parker, who’s said its scuzzy, slip-sliding riff was intended to piss off Mick Jagger. There are certainly hints of Keith Richards’ deceptively simple, effortless litheness to it—not to mention the tense, bluesy skronk of Bowie’s recently departed guitarist Mick Ronson. Still, it’s doubtful that Richards, even in his most smacked-out days, would have dared hold the riff for as long as Bowie does. 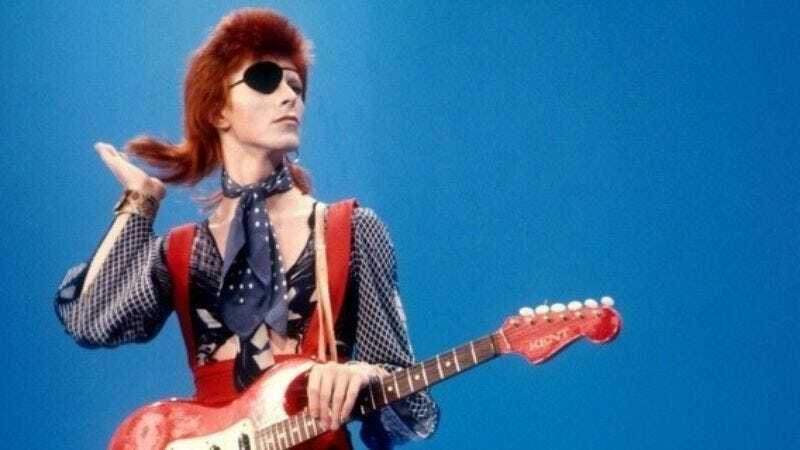 The slinky, snaking structure of “Rebel Rebel” is like an ouroboros, looping itself over and over the boot-stomping beat, that ringing open D note marking the place where it swallows its own tail and emerges fangs-out again. It’s fist-pumping and hypnotic—no mean feat for a single tune. In the recording on 1974’s Diamond Dogs, that main riff goes on nearly uninterrupted for a good four-and-a-half minutes. (Not so in the far shorter, far more crowded U.S. single version.) But as you’ll hear from anyone who’s ever played it on guitar, then found themselves unable to quit, it could go on forever. Bowie himself has told the story of hearing an amateur who couldn’t stop butchering “Rebel Rebel” from a nearby hotel room, then heading off to confront him—an amateur who turned out to be John McEnroe. Sometimes I’m sure my own, far less famous neighbors would like to come up and do the same to me. But as Bowie learned himself that night, in “Rebel Rebel” he’d unleashed a monster—an undying, dangerously addictive riff that would terrorize nightclub stages and Guitar Centers for years after. How could he know?